Unisex Diabetic Comfort Socks. The seamless toe eliminates toe irritation. "MIRACLE STRETCH COTTON"! Non-constrictive top, wide fit sock by Silvert. Superior stretch. 98% & 2% spandex non-shrink cotton. Terrific for light to medium swollen feet and ankles. Sag resistant and easy to put on. The most comfortable high-stretch sock you will ever wear. 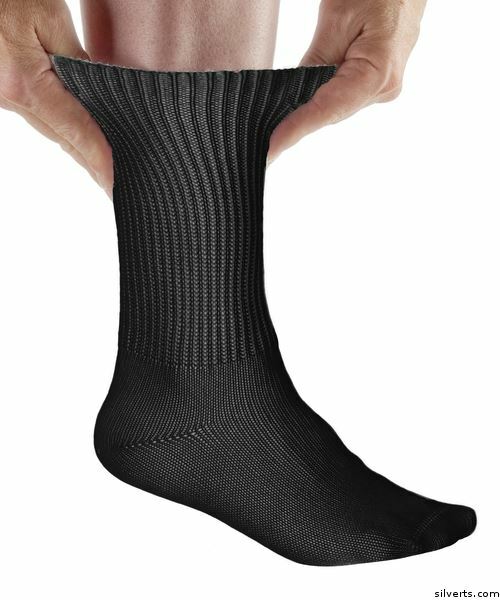 The Simcan Comfort SockÂ® is knit with a unique expandable leg that provides consistent comfort from the entirely flat toe seam to the very top of the cuff. It is designed to accommodate almost any size leg and not restrict the wearerâ€™s vascular circulation. The combination of the miracle stretch fibers and the specialized knitting process provides maximum adherence on the leg to resist slipping. Itâ€™s no wonder that The Simcan Comfort SockÂ® has become Canadaâ€™s favorite affordable health sock.